Unruffled by the move seeking his removal by 64 MPs, Chief Justice Dipak Misra on Monday presided over Supreme Court number 1 - although there were some anxious moments initially. Chief Justice Misra dealt with the cases in his usual ease. DMK MP Kanimozhi has said that the government rejecting the impeachment notice was expected. “What do you expect the government to do? They do not encourage anybody who tries to question them,” she said. On why DMK MPs did not sign the notice, she said that her party does not believe in bringing the judiciary under question. “We hope that there will be discussion and further dialogues between the judges so that they can come to a compromise. This is the last resort for every citizen. That's why party decided not to sign it,” she added. CPI leader D Raja, part of the opposition led by Congress which moved the impeachment motion against the Chief Justice of India, today said the concerned parties would have to examine the grounds on which the notice has been rejected by Rajya Sabha Chairman Venkaiah Naidu. "Concerned parties will have to examine the grounds on which the motion has been rejected by the Vice President. We will have to consult among us, especially who moved the motion," Raja said. ​Senior Congress leader and former law minister Salman Khurshid said today he was not kept in the loop on the impeachment notice against CJI Dipak Misra, and refrained from commenting on Rajya Sabha Chairman M Venkaiah Naidu's decision to reject it. The Congress, which spearheaded an unprecedented move to impeach the Chief Justice of India on Friday, had in fact opposed such proceedings initiated 25 years ago when it was in power. It is interesting to note that all the previous three impeachment motions have been moved when Congress was in power at the Centre. The higher judiciary was in for the shock in 1993 for the first time in independent India when impeachment proceedings were initiated in Parliament against Supreme Court judge V Ramaswami on charges of corruption following the report of the inquiry commission. Senior advocate and Congress Rajya Sabha lawmaker Kapil Sibal, who is at the forefront and spearheading the campaign to impeach the present CJI, however, had put up a spirited defence in favour of Justice Ramaswami in Lok Sabha. Former Lok Sabha Speaker Somnath Chatterjee said today Rajya Sabha Chairman M Venkaiah Naidu acted in a "hurried manner" while rejecting the impeachment notice against Chief Justice of India Dipak Misra. "This instance has set a bad precedence, which is not good for democracy," he told PTI here, adding that Naidu should have followed proper procedures before rejecting the notice. Congress leader, senior advocate Kapil Sibal has said that he will not appear in the court of Chief Justice of India (CJI) Dipak Misra till the latter retires. “I will not appear in the Chief Justice's court from tomorrow onwards... till he retires, because that is consistent with the highest standards of my profession,” said Sibal. Lekhi said that in Hindi the impeachment is called Mahabhiyog prastav, which literally means that the abhiyog (charges or allegations) in this case must have a much more stronger grounding than in other cases. However, the Opposition seems to be relying on words like prima facie, apparently etc. There are not enough documentary or even circumstantial evidence to support their claims. 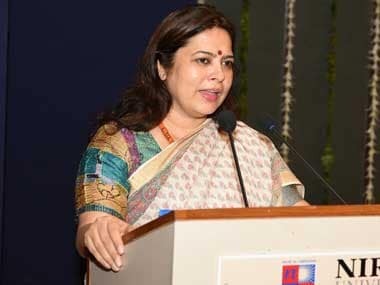 BJP spokesperson Meenakshi Lekhi held a counter press conference to rebut Kapil Sibal's charges. She said that the language of the notice signed by Opposition MPs in itself suggests that the MPs were themselves not sure of their charges. 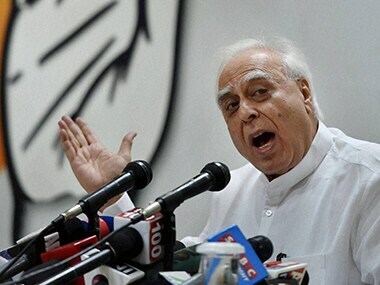 Congress leader Kapil Sibal said that the Congress party will ensure that there is no involvement of Chief Justice of India in the hearing, or listing, of their review petition. Congress further argued that the Rajya Sabha Chairman's order rejecting the motion of impeachment was unprecedented. He said that presenting a motion was the MP's privilege. He said that Naidu wrote in his order that the Opposition's charges are not proven, however, by rejecting the notice they ensured that an enquiry does not happen. Sibal said that the onus of proving the charges was not on the MPs, it was on the judicial committee formed after the motion was admitted. Kapil Sibal said that Venkaiah Naidu decided the matter within hours of returning to India after a foreign visit. He said that such momentous issues must be given their due diligence and attention. It is a hasty decision as by this, the government appears to be in a tearing hurry to block the attempts at an enquiry. Kapil Sibal, in his press conference, said that the law lays down the procedure in case the motion to impeach a Supreme Court judge. The Chairman of the Rajya Sabha must consult an emminent jurist, a judge of the high court and the Chief Justice of India. In this case, the judges of the collegium must have been consulted as the CJI himslef was under scrutiny. Hence, the decision to rehect the motion is illegal, Sibal said. Sibal, in a press conference, said that it is their "privilege to move the motion" and the vice president in his capacity as chairman of Rajya Sabha cannot boot this privilege. Congress leader and eminent lawyer Kapil Sibal addressed a press conference to respond to theobjections raised by Venkaiah Naidu in his order rejecting the impeachment motion against the Chief Justice of India. Eminent jurist Soli Sorabjee today said the Congress-led opposition had no chance to succeed in the Supreme Court against Vice President M Venkaiah Naidu's decision rejecting impeachment notice against Chief Justice of India Dipak Misra. Reacting to Naidu's order rejecting the impeachment notice against the CJI moved by 64 MPs, the former Attorney General of India said that the RS chairman has "applied his mind" after consulting legal experts on the issue. Lashing out at Congress president Rahul Gandhi after his 'save Constitution protests', BJP's Sambit Patra said that the Congress party does not trust army, Supreme Court, Election Committee, EVMs, or even RBI. The Congress party will move Supreme Court for a judicial review of the Rajya Sabha Chairman’s order rejecting the impeachment motion against CJI Dipak Misra. Meanwhile, the party questioned how could the vice president decide such a matter within hours. "Within hours of 64 MP’s submitting the impeachment motion, Leader of Rajya Sabha (FM) had expressed naked prejudice by calling it a ‘revenge petition’ virtually dictating the verdict to Rajya Sabha Chairman on that day. Has ‘Revenge Petition’ now become ‘Rescue Order’?,” Randeep Surjewala said. CPM general secretary Sitaram Yechury expressed his disappointment and said Venkaiah Naidu's move to reject the CJI impeachment notice was a wrong one. "This was a wrong move by chairman of Rajya Sabha. This motion was not given proper attention. Something else is behind this. Independence of judiciary is in danger," he said. 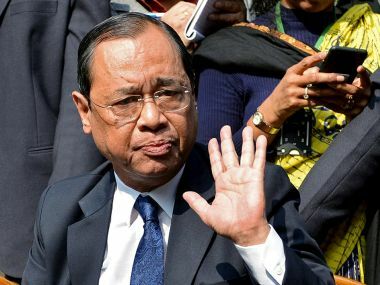 Eminent jurist Fali S Nariman Monday said the issues raised in the impeachment notice against CJI Dipak Misra were not of "sufficient gravity and rightly rejected" by Vice-President M Venkaiah Naidu. Nariman said Naidu, the chairman of the Rajya Sabha, was the only statutory authority to take the decision on the notice. Speaking at the 'Save the Constituition' campaign in Delhi, Congress chief Rahul Gandhi said: "The Supreme Court is being muzzled and crushed. People have lost faith in the judiciary." Follow the LIVE updates on Rahul Gandhi's speech here. Congress spokesperson Randeep Singh Surjewala said Venkaiah Naidu can't adjudge the motion as he as no merits to decide on the merits of the motion. "RS Chairman can’t adjudge the motion, for he has no mandate to decide the merits of the motion," he tweeted, adding, "This is truly a fight between forces ‘Rejecting Democracy’ & voices ‘Rescuing Democracy’." He also said Naidu's decision exposed Leader of Rajya Sabha Arun Jaitley's "naked prejudice" by calling it a revenge petition. 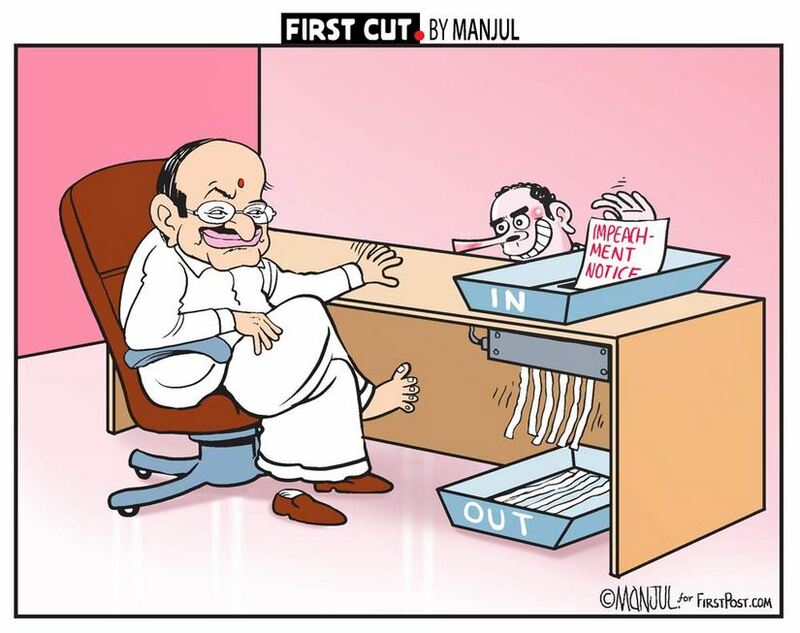 "Within hours of 64 MP’s submitting the impeachment motion, Leader of Rajya Sabha(FM) had expressed naked prejudice by calling it a ‘revenge petition’ virtually dictating the verdict to Rajya Sabha Chairman on that day. Has ‘Revenge Petition’ now become ‘Rescue Order’?" he tweeted. As per a copy of the order rejecting Opposition's CJI impeachment notice, Rajya Sabha chairman Venkaiah Naidu said that the allegations "seriously" undermine the judiciary's independence. "Charges made on suspicion and assumption. Allegations seriously undermine the independence of the judiciary. None of the five allegations in the notice were tenable or admissable," he reportedly said. Tweeting shortly after Vice-President Venkaiah Naidu rejected the Congress-led Opposition, party leader Abhishek Manu Singhvi said: "Expectedly, Sh Naidu rejected imp’ment motion. Unexpectedly, he did so within one day of returning from outstn. Hopefully, the alacrity was not intended to render infructuous calls for CJI to stop Admn work." The Congress party earlier had said that it would consider moving the Supreme Court if the notice of CJI impeachment was rejected, PTI had reported. Party leaders had said that if the Rajya Sabha chairman did not find merit in the notice, the decision would call for a judicial review. "The chairman's decision is open to being challenged. It is bound to go for a judicial review," the report quoted a Congress leader as saying. 1) Violation of Rajya Sabha guidelines by Opposition parties: While reviewing the notice, the Rajya Sabha officials had mentioned that making public the contents of a notice before it is admitted by the chair is in violation of parliamentary rules. According to the provisions in the handbook for Rajya Sabha members, no advance publicity should be given to any notice to be taken up in the House till it is admitted by the chairman. 2) No proof to back five allegations were true: Reports said that another reason the motion was rejected is that there was no proof available to back the five allegations levelled against CJI Dipak Misra. According to sources, Naidu wanted to clear the mess before the Supreme Court reconvened on Monday so that Chief Justice Dipak Misra faced no embarassment, reported News18. Vice-President M Venkaiah Naidu on Monday rejected the Congress-led notice to impeach the Chief Justice of India, Dipak Misra. An official in Parliament stressed that making public the contents of a notice before it was admitted violated Parliamentary rules. This assumes significance in the wake of the seven opposition parties, led by the Congress, initiating an unprecedented step last week for the impeachment of CJI Misra by moving a notice levelling several charges against him. According to the provisions in the handbook for Rajya Sabha members, no advance publicity should be given to any notice to be taken up in the House till it is admitted by the chairman. "A notice for raising a matter in the House should not be given publicity by any member or other person until it has been admitted by the Chairman and circulated by members. A member should not raise the issue of a notice given by him and pending consideration of the Chairman," according to Rule 2.2 of Parliamentary Customs and Conventions in the handbook. The Congress was also trying to build up "moral pressure" on the Chief Justice of India in the hope that he would step aside from judicial duty if an impeachment motion was moved against him. Judges who faced impeachment had earlier stepped aside from judicial work and the Chief Justice should do the same, a party leader said. As the Congress awaits the decision of Rajya Sabha Chairman M Venkaiah Naidu on an impeachment notice moved by it and other parties against Chief Justice of India Dipak Misra, it is considering moving the Supreme Court if the petition is rejected, party leaders said. They said if the Upper House chairman did not find merit in the notice for the impeachment, the decision could call for a judicial review. "The chairman's decision is open to being challenged. It is bound to go for a judicial review," said a Congress leader. Congress alleged that the CJI's behaviour in the Prasad Education Trust case was questionable. There are several recorded conversations between middlemen including a retired judge of the Orissa HC, wherein references to Misra by innuendo are evident. The second charge, relates to the CJI's handling of a writ petition which sought an investigation into the matter of Prasad Education Trust, in which he too was likely to be investigated. The CJI should have recused himself from the case, the party said. The fourth charge relates to the Chief Justice having acquired land when he was an advocate by giving an affidavit which was found to be false. Congress alleged that CJI abused his power as master of the roster in choosing to send sensitive matters to particular benches with an intent to influence the outcome. Justice Fali Nariman, speaking to The Indian Express, conceded that the fact that other senior judges felt that CJI was not being fair in allocation of cases was a very grave problem. However, he said that the spritit of collegiality should be preserved. 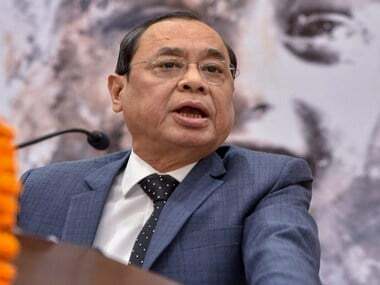 He also said that the government will "not be that foolish" to not appoint Justice Ranjan Gogoi as CJI, who is next in line, in terms of seniority. "It all comes down to a majoritarian government,” Nariman said, adding, “when you have a majoritarian government, these things happen. When you don’t have a majoritarian government, then people are more careful," he said. Reacting to the impeachment motion proceedings initiated by seven Opposition parties, the Supreme court has expressed its concern on the issue. The apex court has reportedly sought assistance from Attorney General KK Venugopal asking his opinion on whether media should be stopped from discussing the impeachment motion. "To use the power as intimidatory tactics when neither you have a case of “proven misconduct” or the numbers on your side, is a serious threat to judicial independence. My preliminary reaction to the impeachment motion filed today is clear. It is a revenge petition after the falsehood of the Congress Party has been established in the Justice Loya death case," Jaitley wrote. "I am not party to or privy with discussions that have taken place between different parties and for me to reflect specifically on whether the grounds are justified would be unfair," Khurshid told reporters. His statement was being seen as a tacit way of underlining the seriousness of the matter to his own party colleagues, as he chose to stay away from the impeachment notice initiated by Congress and supported by 6 other political parties. Seven Opposition parties have come together to set in motion the House proceedings to impeach the Chief Justice of India Dipak Misra. Seventy one MPs from seven political parties had signed the impeachment motion but as seven have retired, the number is now 64. The impeachment motion needs to be supported by at least 50 Members of Parliaments. "These rumours are absolutely false. Remember, this is a very serious issue. We intentionally did not involve Dr Manmohan Singh because he has been the prime minister," said Kapil Sibal. "There are various taped conversations with the CBI in which a retired Orissa High Court judge is talking about some deals with other people. This conversation also mentions the CJI...this ia a very serious issue," said Kapil Sibal. "The choice was not easy. The Constitution allows only one recourse. Because there was no other option apart from an impeachment motion, we moved this motion with a heavy heart," said Kapil Sibal. "We only wish to state that anyone occupying the office of Chief Justice of India must be judged on the basis of highest standards of integrity. The first charge relates to the conspiracy to pay illegal gratifications," Sibal said. "There are questions about the ways in which he has dealt with certain cases. There have been internal rumblings about these issues," said Kapil Sibal. "Four senior judges publicly expressed their disquiet about the CJI's manner of exercising his powers," he added. "In their letter, the judges stated that administration of the court has not been proper. They said that time and again, they tried to collectively persuade the Chief Justice that certain things are not in order. They lamented that their efforts had failed and all four of them were convinced that unless the institution is preserved, democracy will not survive," said Sibal. "We were hoping that the anguish of the judges would be addressed by the Chief Justice and that he would set his house in order. More than 3 months have passed, nothing has changed. The Chief Justice has not asserted the independence of the judiciary in the face of pressure by the executive," Sibal added. "We, on behalf of seven parties which have signed the motion, and also on behalf of the ones who have not signed the motion, met the Rajya Sabha Chairman at his residence at noon," said Ghulam Nabi Azad. "We have moved a motion for impeachment of the Chief Justice of India under five listed grounds of misbehaviour. We have sought his removal," Azad said. PTI reports that over 60 MPs belonging to seven political parties have signed the notice for impeachment proceedings against CJI. Congress, NCP, CPM, CPI, SP, BSP and Muslim League are among parties that signed the notice. Shortly after Congress president attacked the Narendra Modi and the Bharatiya Janata Party at a rally in Delhi, BJP chief Amit Shah hit back. "Our institutions which are an outcome of our Constitution today need to be saved from the onslaught of the Congress Party. The Congress Party has spared no institution and is attacking the EC, Supreme Court, Army for petty political gains," he said. Our institutions which are an outcome of our Constitution today need to be saved from the onslaught of the Congress Party. The Congress Party has spared no institution and is attacking the EC, Supreme Court, Army for petty political gains. Eminent jurist Soli Sorabjee on Monday said the Congress-led Opposition had no chance to succeed in the Supreme Court against Vice-President M Venkaiah Naidu's decision rejecting impeachment notice against Chief Justice of India Dipak Misra. 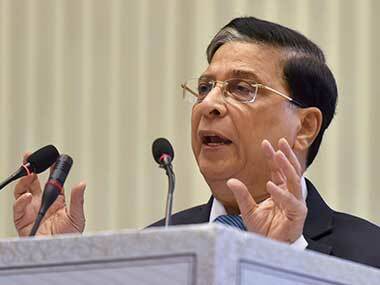 Supreme Court judges, including Chief Justice Dipak Misra, on Monday initiated court proceedings at 10.45 am instead of the scheduled 10.30 am amid speculation that they held a brief meeting on the issue of the impeachment notice against the CJI. CJI Misra, who usually holds his court at 10.30 am, entered the courtroom almost 15 minutes late and started hearing lawyers who wanted their petitions to be listed for urgent mentioning. BJP leader Subramanian Swamy was among the first few litigants to mention his petition for urgent hearing. The CJI's courtroom was packed with lawyers including those who had no matters to argue for. Rajya Sabha Chairman M Venkaiah Naidu rejected the notice given by opposition parties led by the Congress for impeachment of Chief Justice of India Dipak Misra citing lack of substantial merit in it. Naidu held extensive consultations with top legal and constitutional experts, including former chief justices and judges, before taking the decision, sources said. Naidu said in an order on Monday said, "We cannot allow any of our pillars of governance to be weakened by any thought, word or action," he said. The Rajya Sabha chairman said that after having perused annexures to the motion, detailed consultations and studied opinions of constitutional experts, he was "satisfied that admission of this Notice of Motion is neither desirable nor proper." "As far as the Congress is concerned, the party knew all along that this is going to happen eventually. The politics is that under no circumstances, Rahul Gandhi's political career is being furthered. So after the BS Loya case, the frontal attack of the Congress party against the judiciary was evident. They knew they never had the numbers and that this (impeachment motion) would fall, but they wanted to give a veiled threat. It was a threat to the judiciary as Arun Jaitley had said in his blog," said BJP leader Sambit Patra. BJP MP Meenakshi Lekhi told reporters that the Congress wanted to politicise the issue after Rajya Sabha chairman M Venkaiah Naidu rejected the Opposition's motion to impeach the CJI. On Sunday, Rajya Sabha Chairman M Venkaiah Naidu set in motion the process of consultation on the impeachment notice against the CJI and held discussions with a number of constitutional and legal experts, including Attorney General KK Venugopal, and former top law officer K Parasaran. According to officials, Naidu spoke to former Lok Sabha secretary general Subhash Kashyap, ex-law secretary PK Malhotra and former legislative secretary Sanjay Singh on the issue. In the 10-page order, Rajya Sabha chairman refers to para 2.2 of the Handbook for Members of Rajya Sabha and mentions that the press conference after the impeachment motion is "against propriety and parliamentary decorum as it denigrates the institution of CJI", reported Bar and Bench. Within hours of 64 MP’s submitting the impeachment motion, Leader of Rajya Sabha(FM) had expressed naked prejudice by calling it a ‘revenge petition’ virtually dictating the verdict to Rajya Sabha Chairman on that day. Has ‘Revenge Petition’ now become ‘Rescue Order’? RS Chairman can’t decide on merits in absence of quasi judicial or administrative power (M.Krishna Swami’s case). If all charges were to be proved before inquiry as RS Chairman suggests, Constitution & Judges (Inquiry) Act will have no relevance. "We'll examine the grounds on which it was dismissed. I don't think it is a setback. We're a democracy," CPI leader D Raja told CNN-News18. "Conversations between third parties with dubious credentials, which have been extensively relied upon, cannot themselves constitute any material evidence against the holder of the office CJI," said Venkaiah Naidu on impeachment motion. Rajya Sabha chairman M Venkaiah Naidu stated in the order that, "After having perused annexures to the motion and having detailed consultations and having studied opinions of constitutional experts, I am satisfied that admission of this notice of impeachment motion is neither desirable nor proper." Speaking to ANI, BJP leader Subramaniam Swamy said, "He (Venkaiah Naidu) has decided correctly. He need not have taken two days to make the decision. It should've been considered null and void and thrown out from the beginning. Congress committed suicide by doing this." "They have shot themselves in the foot and destroyed their chances in Karnataka," Swamy told CNN-News18. CNN-News18 reported that the Congress party will address the media at 1.30 pm after Rajya Sabha chairman Venkaiah Naidu rejected the Opposition motion to impeach the CJI Dipak Misra. "Motion undermines independence of judiciary. No credible or verifiable facts. MPs are unsure of their own charges against the CJI. Most of the charges are internal matters to be resolved by Supreme Court itself," said Venkaiah Naidu in the 10-page order. CJI Impeachment Latest Updates: Congress leader Kapil Sibal said that the Congress party will move Supreme Court to file a review petition of Venkaiah Naidu's order. He termed the decision to reject motion of impeachment as unprecedented, hasty and illegal. Speaking at the 'Save the Constituition' campaign in Delhi, Congress chief Rahul Gandhi said: "The Supreme Court is being muzzled and crushed. People have lost faith in the judiciary." Speaking to CNN-News18, Additional Solicitor General of India Satya Pal Singh said, "It is within the powers of Rajya Sabha chairman Venkaiah Naidu to reject the order. This was politically motivated and they (Congress) wanted to malign the judiciary." Calling the impeachment motion an internal matter of the Supreme Court, Rajya Sabha chairman Venkaiah Naidu said. In the 10-page order, Rajya Sabha chairman refers to para 2.2 of the Handbook for Members of Rajya Sabha and mentions that the press conference after the impeachment motion is "against propriety and parliamentary decorum as it denigrates the institution of CJI". "Conversations between third parties with dubious credentials, which have been extensively relied upon, cannot themselves constitute any material evidence against the holder of the office CJI," said Venkaiah Naidu on the impeachment motion. As per a copy of the order rejecting Opposition's CJI impeachment notice, Rajya Sabha chairman Venkaiah Naidu said that the allegations "seriously" undermined the judiciary's independence. "Charges made on suspicion and assumption. Allegations seriously undermine the independence of the judiciary. None of the five allegations in the notice were tenable or admissable," he reportedly said. Rajya Sabha chairman Venkaiah Naidu on Monday rejected the impeachment motion against Chief Justice of India Dipak Misra by seven opposition parties. Sources said the motion was rejected on grounds that the charges were not sufficient for impeachment. On Friday, the Congress-led Opposition moved a notice to impeach him and accusing him of "misbehaviour" and "misuse" of authority on Friday. The vice-president cut short his visit to Hyderabad and reached New Delhi to hold deliberations over the notice given by the seven Opposition parties. He also held deliberations with senior officials of the Rajya Sabha Secretariat, they said, adding that Naidu also spoke to former Supreme Court judge B Sudarshan Reddy. The officials said the vice-president also spoke to the attorney general on the issue. Leaders of the Opposition parties had on Friday met Naidu and handed over the notice of impeachment against the CJI bearing signatures of 64 MPs and seven former members, who recently retired. While reviewing the notice, the Rajya Sabha officials had mentioned that making public the contents of a notice before it is admitted by the chair is in violation of parliamentary rules. According to the provisions in the handbook for Rajya Sabha members, no advance publicity should be given to any notice to be taken up in the House till it is admitted by the chairman. The move to propose impeachment notice against the CJI has led to a slugfest between the Congress and the BJP. Meanwhile, the Congress said that the CJI should considering recusing himself from judicial and administrative duties until his name is cleared. The BJP has said the Congress was trying to demean, degrade and denigrate the judiciary by moving the notice.